China's Century  or India's? With so many of the world's economies in tatters, the combined might of China and India could spearhead global growth in the coming decades. Are they up to the job? I saw the Indian hit movie 3 Idiots recently in an unusual location: a cineplex in Hong Kong. Very rarely do Bollywood flicks make the city's commercial circuit  the conventional wisdom holds that they do not appeal to local audiences. Yet my Sunday morning matinee was 80% filled, mostly with Chinese of all ages. Some took the movie at face value: the zany antics of Indian college kids. But the majority of viewers, it seemed to me, got the universal moral about breaking free from social straitjackets. They laughed when they were meant to, and didn't when they weren't. While the foreign 3 Idiots was a box-office monster, 1911, a China-backed war docudrama starring hometown celebrity Jackie Chan, bombed. Go figure: India 1, China 0. Introducing India's 3 Idiots to a Chinese audience won't make the cut of epic attempts to break down barriers between cultures. But it does tap into a spreading consciousness that China and India and their people share a special place among today's nations  a tandem locomotive pulling the global economy while much of the rest of the world is a train wreck. You've heard the drumbeat: stupendous growth rates; ever richer consumers; geopolitical clout  a new order trumpeted by mega-events and extravagant slogans like the 2008 Summer Olympics in Beijing and "Incredible India" at Davos. "The rise of India and China," writes Robyn Meredith in her seminal book, The Elephant and the Dragon, "has caused the entire earth's economic and political landscape to shift before our eyes." Indian politician Jairam Ramesh sums up the phenomenon in a neologism: Chindia. With Western economies reeling, the world is looking especially to China and India as saviors  whether it's buying Italian bonds or Italian bags. The E.U. is even begging Beijing to help bail out its euro-zone bailout fund. But that's only one side of the coin. There's a duality to China and India, a blend of reality and myth, internally as well as between them. 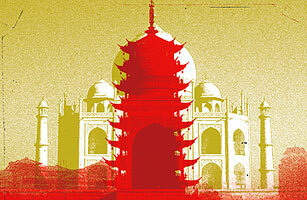 China and India have an arabesque relationship. These two giants on the cusp of superpower-hood are more rivals than partners. Despite their achievements, they face enormous challenges. And though they add up to nearly 40% of the world's 7 billion population, they still live pretty much in parallel universes. Chinese and Indians, writes Indian journalist Pallavi Aiyar in her perceptive book, Smoke and Mirrors: An Experience of China, are "largely culturally untranslatable to each other." As a Gujarati born, raised and living in overwhelmingly Cantonese Hong Kong  both tribes are brash and materialistic  I have long been privy to what local Chinese and Indians think of the other. It used to be downright ugly. Perceptions and attitudes, liberally spiced with racial epithets, went broadly like this: to the Chinese, the Indians were poor, superstitious and dirty; to the Indians, the Chinese were crass, godless  and dirty. Hong Kong is no microcosm of Chindia, but it reflects how, just as China and India have changed, so have the stereotypes. If before I were assumed by the Chinese to be someone's chauffeur, now I am a tech entrepreneur or investment banker. Local Indians see China afresh too, but often in just two superficial dimensions: wealth and might. My 17-year-old son's peers are only half-joking when they tell him that, because he is half Chinese, half Indian, he has it made. If only it were that simple. In her book, Meredith quotes Indian tycoon Ratan Tata saying, "China is the factory of the world; India can be the knowledge center of this region ... If we orient ourselves to working together, we could be a formidable force of two nations." That's ambitious  and perhaps unrealistic. China and India were once soul mates  through the migration of Buddhism some 2,000 years ago. Later, the Indian monk Bodhidharma traveled to China to spread the message of Zen. Prominent Chinese went the other way: the devout pilgrim Xuanzang, later immortalized in the classic Ming novel Journey to the West, and the great explorer Admiral Zheng He. It was a time of mutual discovery. By the 17th century, the Middle Kingdom and the subcontinent were the planet's trading powers. They then got caught up in their own worlds of feudalism and colonialism  a decaying dynasty in China, the British Raj in India  followed by decades of serial revolution and fervent socialism. Modern relations between the two countries were marked mostly by suspicion  and the occasional border war. See photos of China's great 2011 migration.